Find out why the Pit Barrel Cooker won our Editor’s Choice award for Best BBQ Smoker for Beginners as well as where the 5 other excellent choices fall in. Getting into BBQ is one of the most satisfying hobbies a person can get into. It’s relatively easy to pickup and the result is delicious food the whole family can enjoy. One of the keys to making sure your food is consistently delicious is to not get in over your head with an expensive cooker geared towards experienced pit masters. 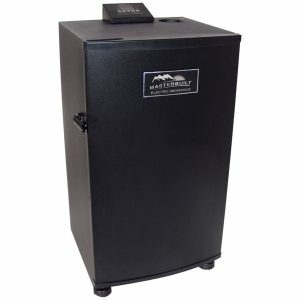 Another pitfall many make with their first smoker is grabbing a $75 offset smoker special from their local big box store. Most of these have poor build quality and even worse air flow control. This can make managing your target temperature a chore resulting in bad food and a bad time. Build Quality: One of the most important things to consider with a smoker at any price range and skill level is its build quality. If your unit leaks air or has super thin walls, regulating the temperature can be a huge chore. Obviously for charcoal powered units your heating element is as good as the charcoal you buy but in cheaper electric or propane powered units the heating element can be a huge source of heartache if you do not go with a quality unit. Efficiency: How efficient a smoker is directly relates to how much fuel the smoker must use to hold a good solid smoking temperature. This all goes back to build quality. If your smoker is leaking heat and smoke in places that it isn’t suppose to then your smoker will have to burn more fuel to maintain the temperatures you want to stay at. This can be especially frustrating on charcoal units as usually you would have to pull the food out to add more charcoal. Not fun. Value: As with everything else, we want the best value for our dollar. One of my favorite sayings is “buy once, cry once” and it certainly holds true when wanting to invest in a smoker. 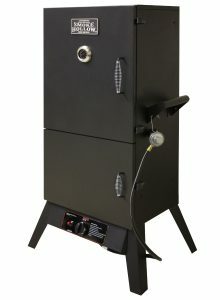 It may hurt to spend more than $100-$200 on your first smoker but what really hurts is buying that cheap big box special only to be frustrated with its build quality and performance. It will then lie unused in your backyard or find its way to the landfill. Support: It’s much easier starting with a unit that has a solid community built around it. Most smokers on this list have multiple youtube videos and forum write-ups on how to cook certain cuts of meat, how to light and heat up properly and how usually some fun DIY improvements. This is rarely an issue with charcoal based units because there’s nothing to break but with electric and propane units its important to consider warranty. What the warranty covers and how a consumer goes about getting a part replaced on their smoker are all things to consider when shopping. Fuel Source: Perhaps second only to build quality in importance. Choosing the correct fuel source can make a huge impact on your food and more importantly, how often you use your smoker. I personally believe the best flavor comes from charcoal or stick burnering (wood burning) smokers. The downside to using charcoal is it is generally messier (not that bad, really) and it generally has a slightly higher learning curve along with slightly higher preparation time. Electric and propane are super easy to use, generally set it and forget it. The downside is the flavor just isn’t there for me although some of the high end pellet style grills are getting better (i.e. Yoder). Bottom line, choose the fuel source that fits you and that you will actually use. If you do not see your self working with charcoal then go with an electric or gas setup. Some BBQ with a tad less flavor is about 10x better than no BBQ at all. I’ll make this easy for you. 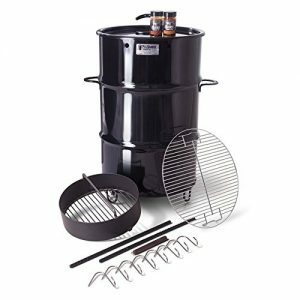 If you are a beginner and want the easiest to use charcoal smoker then go no further than the Pit Barrel Cooker. I bought one of these about 6 months after they were released and was absolutely blown away with how easy it was to use. What makes the Pit Barrel special is there is no temperature regulation. It sounds counter intuitive but Noah (Pit Barrel Cooker creator) has the venting setup perfectly. The other special thing about the PBC is the fact that you hang the meet from the supplied hooks and rebar. Up top, you have four holes drilled for the two rebar pieces to run through. These are fixed holes and the rebar obstructing them regulates the airflow. On the bottom you have a variable vent that you set depending on the elevation you are cooking at. That’s it. PBC recently went from a powder coat finish to a porcelain enamel finish similar to the Weber. When getting ready to cook on the Pit Barrel Cooker you remove the charcoal basket and fill it up to the top. You then remove about a quarter of the briquettes and place them in a charcoal chimney such as the Weber Rapidfire Chimney and light them. Place the unlit charcoal basket back in the PBC and pour the lit charcoal from the chimney on top. After doing this you can add a couple chunks of wood for smokey flavor. Immediately place rebar in the holes and place the lid on. After a couple minutes the barrel will be preheated enough to hang the meat on. I have found the PBC can go 7-10 hours on a load of charcoal depending on the weather outside. A common concern with this unit is the fact that it cooks hotter and faster than a traditional smoker. I can tell you this does not seem to matter as all the meat I have cooked on this has turned out very juicy with a great smoke ring. The Weber Smokey Mountain is a contender on even the highest levels of smoking. There are teams on the competitive smoking circuits that elect to use this unit going against $20k+ custom built trailers. 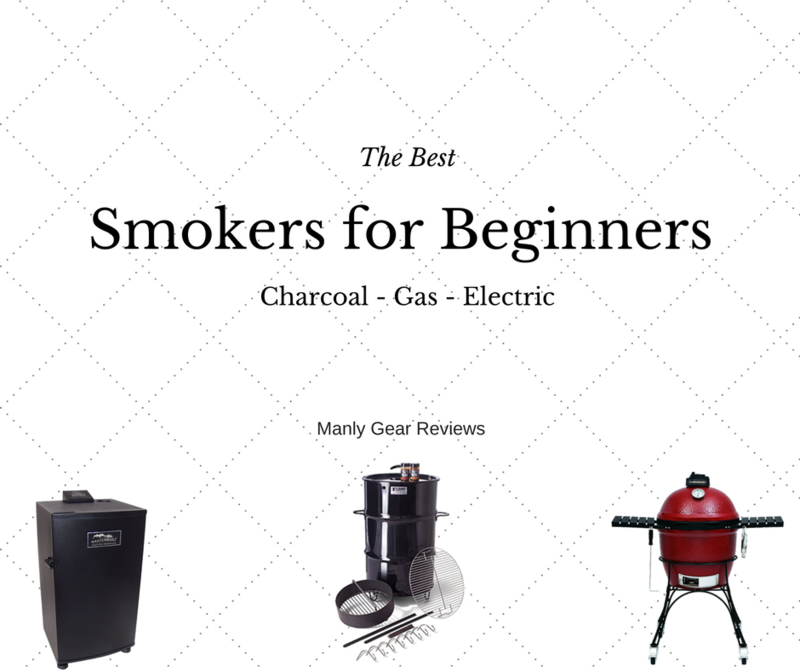 So why didn’t I put this as the number one charcoal smoker for beginners? Quiet simply, the learning curve isn’t quiet as “set it and forget it” as the PBC is. While the PBC and WSM (Weber Smokey Mountain) are both vertical smokers, that is where their similarities end. 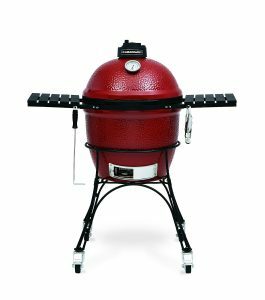 The WSM is a three piece design with vents controlling airflow top and bottom with an access door in the middle. I can say 90% of the time you are going to be lifting the top lid to access and check food. There are several different ways people light the WSM but it is generally pretty similar to PBC. The WSM can be operated at standard smoking temperatures (225 and up) and loves the addition of a water pan. The 22″ model has multiple racks that allows room for multiple racks along with a brisket. With the ability to choose 3 different sizes and the willingness to invest a little more time to master how to run this smoker, you will not be disappointed. The Smoke Hollow LPG Smoker is a true surprise for the money. With propane you loose some ability to form an excellent bark but holy cow is this unit easy to use. Attach your propane tank, ignite, set temperature and make sure the water and wood boxes are filled. That’s it. The smoke box on this unit is fairly large for its class being able to fit all but the largest of briskets. Multiple racks means whole chickens along with multiple racks of ribs are no problem. It’s important to always keep the door or lid closed on a smoker but its especially important on a cabinet style smoker like this one. Be aware that peeking can let out almost all of that wonderful smoke so check meat sparingly. If you want to get your feet wet with a smoker but don’t want to get your hands dirty with charcoal its hard to beat the Smoke Hollow for the money. This Masterbuilt Electric Smoker has had the sub $200 electric smoker market cornered for years. Looking like your college mini-fridge, this little unit has the simplicity of a propane smoker but the benefit of plugging into an outlet on your porch. The first thing you’ll notice with this unit is how much space you have. The heating element takes up very little room allowing enough space for 8 pork shoulders. 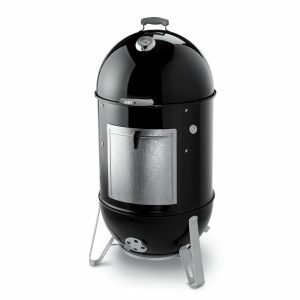 With 4 removable racks, this smoker can fit a turkey or a smaller brisket. The top mounted control panel makes it easy to adjust to your target temp. This is a great alternative to the charcoal units for a beginner looking to get started. Combo grills can be a mixed bag but if you are sure its the route you want to go the Char-Broil Oklahoma Joe is about as good as its going to get. Char-Broil gets some bad press, mostly because of all the low end units they populate the big box stores with. This particular unit is built to a noticeably higher standard than their cheaper units. Obviously the draw to this smoker is that you have an offset smoker and a propane grill all in one unit. The grill portion has 3 burners plus a side burner that is also meant to double up as a chimney starter for your charcoal chimney! That’s good thinking right there. The doors and general construction on this unit is pretty decent although you do give up a little fit and finish to the other dedicated smokers in this list. Offset smokers do require a little more practice than something like the PBC but if you are willing to go slow and do a pre-burn (recommended on this unit anyways) I think you will have a successful first smoke. 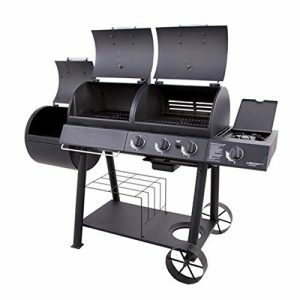 If you’re main attraction to this unit is the ability to grill and maybe smoke something every once and while I’d give a good look to the Kamado style grills further down the page. They are extremely capable of grilling fast and hot but also smoking low and slow. However, if you want to stick with propane for your grilling this unit should be just fine. Nice to be able to grill and smoke at the same time! Last but certainly not least, the Kamado Joe Classic. Most smokers on this list do one thing and do it extremely well. Smoke. The Kamado style cooker is a different breed. Based on ancient Japanese cookers the Kamado is a full ceramic grill/smoker/baker/pizza oven – whatever you want. These smokers do best with lump charcoal as their fuel source. One bag will typically last 3-5 cooks depending on what you are smoking and how long and hot it needs to stay. They are exceptionally fuel efficient. When you are done cooking you completely close the top and bottom vent which nearly puts out the flame instantly saving that charcoal for your next cook! This smoker will take a little more hands on than the PBC because you do need to control the airflow with the top and bottom vents, but with a practice run any beginner can get the hang of it. One thing to be aware of: This unit will stay hot for a long time. If you do happen to overshoot your target temperature it can take a long time to cool down. Again, with a little practice this won’t be an issue.